"Every human existence is a proposition about life: this could be life. In the same way, every artwork proposes: this could be art. In this book, I present the concept of generic singularity in order to point towards the event where a human being becomes something specific in time through art. This is first and foremost a philosophical concept of the visual artist as a person. It is at once generic – the being of an artist qualified through the institution of art – and singular: each artist incarnates his/her own singularity. Therefore, no absolute description or perfect definition of the artistic life can be given through the concept, since each individual artist is different. Generic singularity designates a field of artistic existence lived out in infinite ways and modalities. 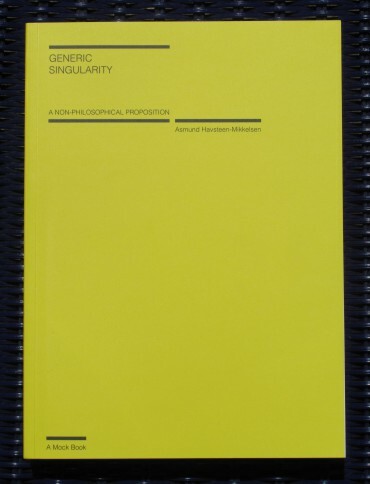 To me, this becoming of a singularity is also an aesthetics of existence, because just as the artwork attempts to surpass art, so the existence of a generic singularity is pushed to its utmost possibility, to the extreme alterity of itself. To become a generic singularity is both to transform a human life through the making of art and to transform art through the infusion of human life into the work of art." Asmund Havsteen-Mikkelsen (b. 1977, Aeroe, Denmark) is a painter who has lived in Berlin since 2007. He received his MA from The Royal Danish Art Academy of Copenhagen in 2009. From 2004 to 2005 he participated in the CCA Research Program in Kitakyushu, Japan, and from 2007 to 2008 he studied at the HFBK in Hamburg. Before enrolling at the art academy, he studied literature and philosophy at the University of Copenhagen (1996 to 2003).